Ronald Lee Locklear, age 63 of Maxton, passed away on Thursday, March 28, 2019 following a courageous battle with cancer. Funeral services will be conducted at 2:00 p.m. Sunday, March 31, 2019 at the Richard Boles Funeral Service Chapel officiated by Pastor Dewayne Lowery. Burial with military honors will follow the service in Spring Hill Cemetery. Ronald, a son of Sarah Bullard Locklear and the late Pastor Nash Locklear was born June 17, 1955 in Scotland County. 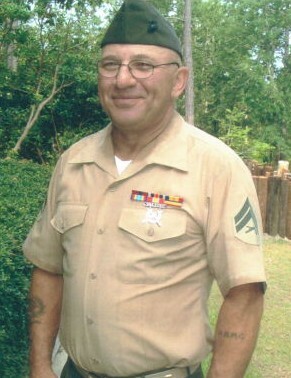 He was a Disabled Veteran who proudly served his country in the United States Marine Corps. He worked as a mechanic with J.P. Stevens, Inc., for many years and served as a member of Shoeheel Holiness Church. In his spare time, Ronald enjoyed building furniture, hunting, and fishing. His greatest joy was sharing time with his grandchildren. Along with his father, he is preceded in death by a brother, Jimmy Locklear. Ronald leaves behind his wife, Darlene Dial Locklear of Maxton; his children, Kendra Alexis Locklear of Marston and Terry Hardin of Pinebluff; step children, Forrest Dial of Rowland and Lydia Hoyos of Maxton; his mother, Sarah Locklear of Red Springs; brothers, Bobby Locklear of Red Springs and Nash Locklear, Jr., of Lumberton; sisters, Dora Lee Jones of Red Springs, Sarah Rose Maynor of Raeford, Annie Brayboy of Lumberton; his grandchildren, Jasmine Locklear, Logan Locklear, Whitney Hardin, Dakota Hardin, Everton Chavis, Bethany Dial, Seth Dial; a great grandchild, Jayden Hardin; special friend, Glenn Locklear of Maxton along with a host of nieces, nephews and many loving friends. Visitation will be from 6:00 until 8:00 p.m. Saturday, March 30th at Richard Boles Funeral Service.